Angiography has been considered the gold standard technique for the diagnosis of chronic mesenteric ischemia. Due to its invasive nature and improvements in noninvasive diagnostic studies, angiography is currently reserved for patients with classic signs and symptoms of chronic mesenteric ischemia who have planned endovascular or open reconstruction. Among patients with atypical symptoms, it is not unusual to have significant delay in diagnosis. 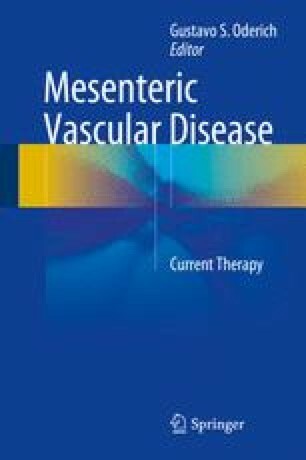 Since the first published evaluation of the splanchnic human vasculature by duplex scanning in 1984, the technique brought up intense interest in the medical community, mainly due to its noninvasive characteristic but also because it provides hemodynamic and anatomic information. In the last decades, duplex ultrasound has proved to be an accurate method to detect stenosis and is typically the first imaging study obtained in the evaluation of patients with suspected mesenteric artery occlusive disease.